You can use planting techniques to make your fence disappear into the scenery as if it sprang forth from it. We love fences for the architectural, practical, and aesthetic elements that they add to our properties. They provide security, privacy, and are beautiful ways to bring more texture to every landscape. Fences also create an obstacle that we must learn to get around to maintain the look of the fence itself and the landscape. Here are some tips for landscaping around your fence. The first tip for landscaping around your fence is to incorporate it into the overall design of your landscape. You can use planting techniques to make your fence disappear into the scenery as if it sprang forth from it. 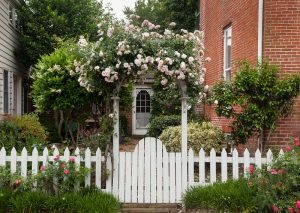 This is achievable through repetition — repeat nearby plantings along the fence to create better flow. In addition, extend your planting to all year-round by working with plant types that thrive in the different seasons. Use vibrant spring flowers and multicolored shrubs in the fall. In the summer, try planting perennials along your fence line and red twig dogwood in winter. Remember before you decide which flowers and plants you’d like to use against your fence line that fences also provide a natural obstacle for them to thrive. As they need ample sunlight, fences can block the light from reaching your plants and flowers. In this case, grouping is the most effective way to respond to the shade. By grouping, you’ll be planting flower and shrub types that require the same amount of sunlight net to each other. The same goes for water requirements. You’ll have to consider the type of fence you have in your landscaping design. Because vinyl fences don’t require much attention or maintenance, you’ll have more freedom in your design. Wooden fences, however, require periodic painting and staining to maintain its beauty. Because of that, you’ll likely need to give your plants some space to breathe, away from those materials. You’ll also need enough space to be able to care for your plants as well, with pruning and other plant maintenance. Vine plants look and work well with chain-link and other metal-style fences. This entry was posted on Friday, February 23rd, 2018 at 12:21 pm. Both comments and pings are currently closed.